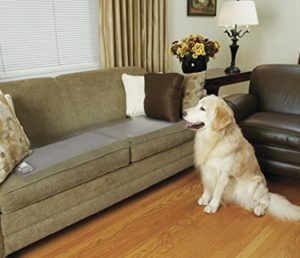 This is your simple and easy solution to Keep Your Dog Off Furniture. The dilemma of how to keep your dog off furniture is a common challenge for many owners. Allowing dogs on the furniture may work for some owners, however it can lead to potential resource guarding aggression, destruction of your couch, and your dog jumping on the furniture whenever it wants (i.e. when you just want to relax or when company visits). I personally do not encourage dogs to be on furniture, as I don’t think the reward is worth the potential risk. If your adult dog does go on the furniture, then we need to teach them that furniture is off limits. Some dogs are very smart and know that they can’t go on the furniture when you are right there, but they will quickly jump on the couch or bed as soon as you leave the room or go out for the day. If that’s the case, we need to have a set-up that will prevent them from going on the furniture whether you are there or not. That is exactly what a ScatMat is designed to do. ScatMats have been used for many years, as a way to keep both dogs and cats off furniture. These are ideal, because you can put them on furniture when no one is sitting there and easily remove them when you want to sit down. They have a low static sensation, very similar to when you rub your feet on the floor and touch a door knob. The static sensation will occur anytime your dog jumps on the furniture (whether you are there or not). After a few attempts, your dog should learn that the furniture is off limits. Once they do, you can remove the ScatMats. If they go back to jumping on the furniture in the future, you can simply lay them back down as a reminder. This is a very simple and easy way to keep your dog off furniture. Want to stop your dog rom jumping on people? Use this article and video. If your dog steals food off countertops, here’s the article and video to help you with that. ScatMat – Click the image on the left to order.